For starters, the exterior styling of the A6 endows the car with instant curb appeal. It looks good standing but also in motion with a blend of traditional Audi design cues, starting with the emblematic four rings as well as a new design “language,” for lack of a better word, that first showed up on Audi concept cars and other cars in its current product portfolio such as the Audi A8 and the Audio A7. The result is a car with broad shoulders, sleek lines, impressive silhouette and aggressive front facia with a bold grille and conspicuous air intakes at the lower corners that emphasize the sportier blood lines of the A6. In addition, LED headlights are standard on the 2019 Audi A6, which also features a distinctive taillight design that continues the designs. horizontal architecture from the front of the vehicle. The adaptive headlight, which also bends the light while turning a corner, system is one of the most effective I’ve tested. Audi has been a leader in integrating new technology into its vehicles and 2019 Audi A6 comes with advanced infotainment and digital systems. On the inside, the cabin offers, which is quiet and offers an excellent view of the road, the driver and the passenger a comfortable environment that is furnished with top-notch materials and a straightforward design that doesn’t hide any of the critical functions. At night, the cabin is crisply lit. The new Audi A6 sedan offers plenty power with superior comfort and style. A new touch pad replaces the rotary dial and the conventional buttons and controls of the previous Audi cockpit layouts Instead there two large, high-resolution touch displays. Voice commands also can be used to set the cabin’s temperature, find a station or make a phone call. While it made considerable amount of information available quickly to the driver, the old system could be confusing and new touch pad are an improvement. Also available on loaded A6 is the Audi virtual cockpit featuring a 12.3-inch display that offers HD resolution, a full-color head-up-display, Audi smartphone interface and a Bang & Olufsen 3D Advanced Sound. 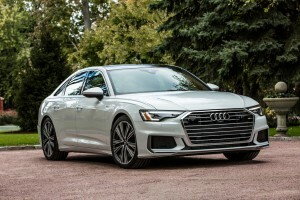 The 2019 Audi A6 also is equipped with a comprehensive suite of standard and available driver assistance systems, which are supported by a central controller that gathers information from up to 24 cameras and sensors to creates a digital picture of the A6’s environment and to pinpoint the vehicle’s best response in any given situation. Another feature available on the A6 offers top view camera system with virtual 360-degree view, available intersection assist and turn assist, available traffic sign recognition. Adaptive cruise assist is also available on the 2019 Audi A6. The interior of the new Audi A6 features top-notch materials and focus new technology. The system is described as a “hands-on” and helps the driver maintain speed and following distance, and with lane tracking with speed ranging from of 0-95 miles per hour and during traffic jams. The standard Audi pre-sense rear can detect vehicles, pedestrians and cyclists in the vehicle’s path at speeds of up to 52 miles per hour and apply the brakes when a potential collision is detected. But while the technical features are impressive, the driving dynamics of Audi A6 are perhaps even more impressive, I found during a week-long test on sometimes slick roads. The A6 is equipped with a new 3.0-liter turbocharged V6 engine, which delivers 335 horsepower and 369 pound-feet of torque, that is matched to a seven-speed automatic transmission and a mild hybrid system that packs 48 volts. The combination never misses a beat and delivers power instantly when needed moving away from a stop or when passing on the freeway. The suspension on 2019 Audi A6 also has been refined and gives the car a sportier feel, which is particularly noticeable on tight turns or during a passing maneuver when the car remains tightly controlled. The body of the A6 uses a mix of lightweight aluminum and high-strength steel to create a higher torsional rigidity than the previous model that also helps improve the car’s overall ride and handling, which is rounded out by solid steering feel and excellent brakes. Consumers have all kinds of reasons for switching to sport utility vehicles and the crossover vehicles. 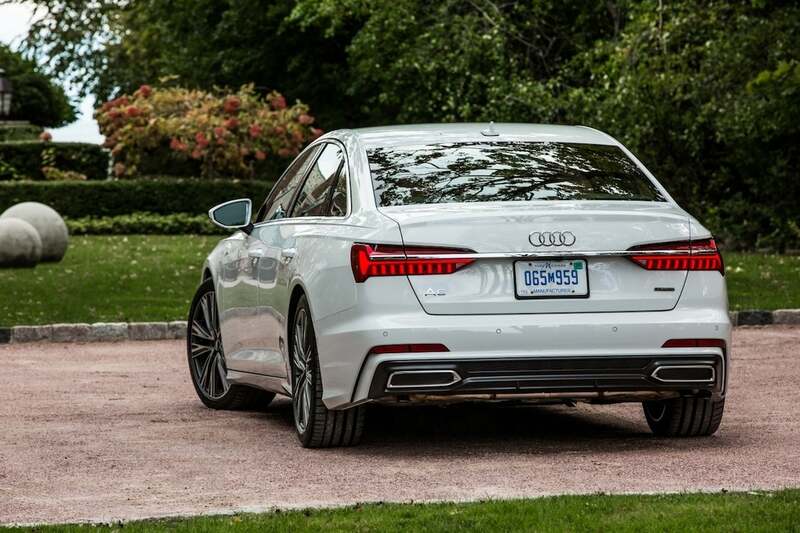 But driving a well-built sedan with a fine suspension like the 2019 A6 offers its own distinct kind of pleasures that are difficult to beat no matter how high off the pavement you’re sitting. This entry was posted on Friday, April 5th, 2019 at and is filed under Asia Pacific, Audi, Automakers, Automobiles, China, Europe, First Drive, Luxury Vehicles, Markets, NAFTA, Reviews, Sales, Sedans, South America, U.S./North America. You can follow any responses to this entry through the RSS 2.0 feed. You can leave a response, or trackback from your own site.